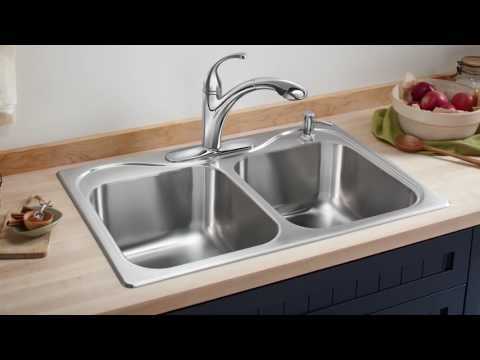 Under-Mount Single-Bowl Kitchen Sink, 31-7/8" x 18-1/16" x 9-5/16"
With the classic look of stainless steel and a pared-down design, the McAllister kitchen sink is an ideal backdrop for nearly any kitchen design. It offers ample workspace and SilentShield(R) technology, an exclusive sound-absorbing system that reduces noise and vibration. The 9-5/16" deep bowl is great for washing everything from cookie sheets to large pots and pans. With the classic look of stainless steel and a pared-down design, the McAllister kitchen sink is an ideal backdrop for nearly any kitchen design. It offers ample workspace and SilentShield© technology, an exclusive sound-absorbing system that reduces noise and vibration. The 9-5/16" deep bowl is great for washing everything from cookie sheets to large pots and pans. Dimensions: L 29-1/2", H 9-5/16", W 15-3/4", D 9"